I thought I would look at the difference in my profiles when comparing them with my profile pre-surgery and then a picture I took yesterday (day 26). 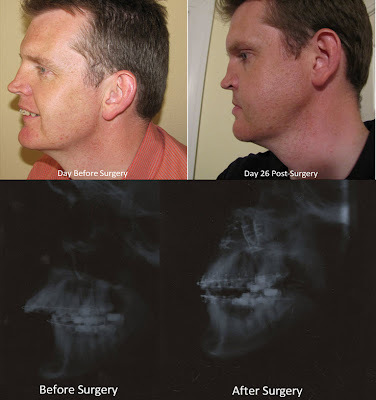 Truthfully, I look at the after picture and the profile looks worse then the before picture but I realise that it is so early after my surgery that a true comparison really is not possible. It will be great to compare once all of the swelling has disappeared and my surgical wires and hooks are removed so that my lips are not affected in terms of their protrusion level. Not sure when all of swelling will disappear - apparently it can take up to a year for this to happen! Other news - my mouth seems to be opening wider than earlier this week as the flat spoon that I talked about in an earlier post can now fit in my mouth! I ate some ice-cream today without slurping! Another small step in the recovery process! You have to take what you can get . . .
My jaws hurt this evening, not because of excess talking (the Doc's bands are still working very well!) but because of the cold! It was a cold day and I didn't even think about it but by the time the outside event had ended, my jaws were aching to say the least! Ah well, it is impossible to remember everything! I ate more today than any day since my surgery; don't get too excited, it was still the same food of mashed potatoes and gravy but I actually at quite a lot not to mention a rather large bowl of ice-cream! Not healthy I realise but one step at a time.